Remember when I went to Australia and shopped for fabric? It was months ago. 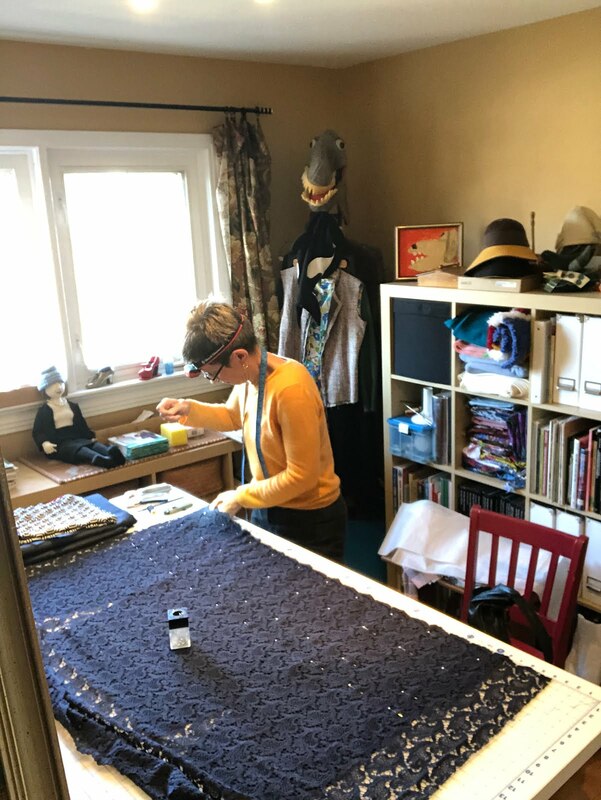 Among the pieces I brought home were a length of dark navy wool jersey and some rather chunky cotton guipure lace (paisley!). Also navy. 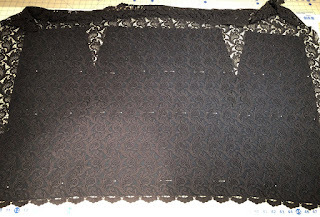 I bought enough for a skirt because the Sewing Lawyer should have a guipure lace skirt. Better late than never! I used the Itch to Stitch Brasov top pattern for the jersey. 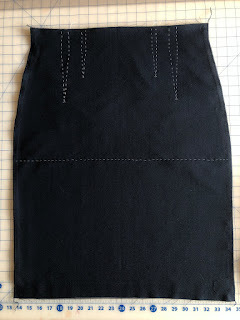 Based on my test sew, I shortened it by about 8cm (3") and eliminated the lowest of the side seam pleats. I'm much happier with the length of this top now. 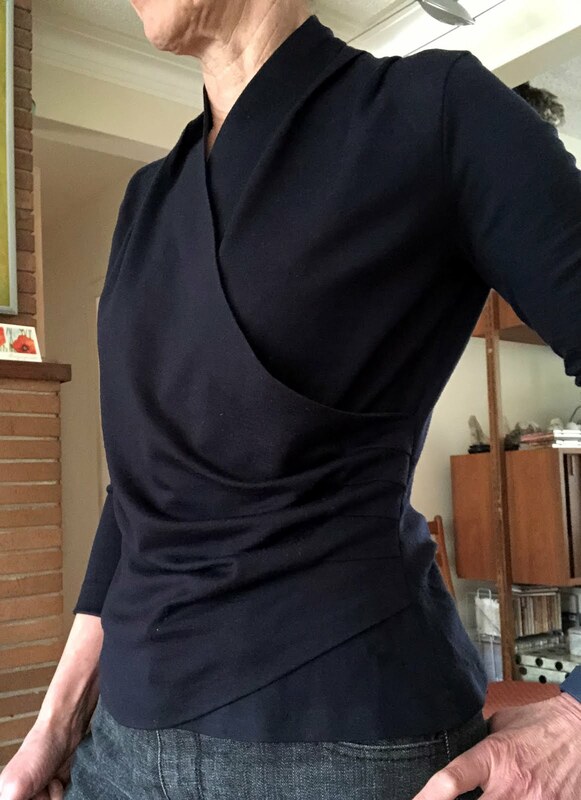 The wool isn't quite as drapey as the rayon I used for my test sew. I had to take that version in quite a bit. The shortening is the only change I made for this version. Now, about that lace skirt. I came across this project on the Burdastyle site - perfection! I realized I had this issue of the magazine (Feb, 2009, a good issue). I traced it and made a muslin. 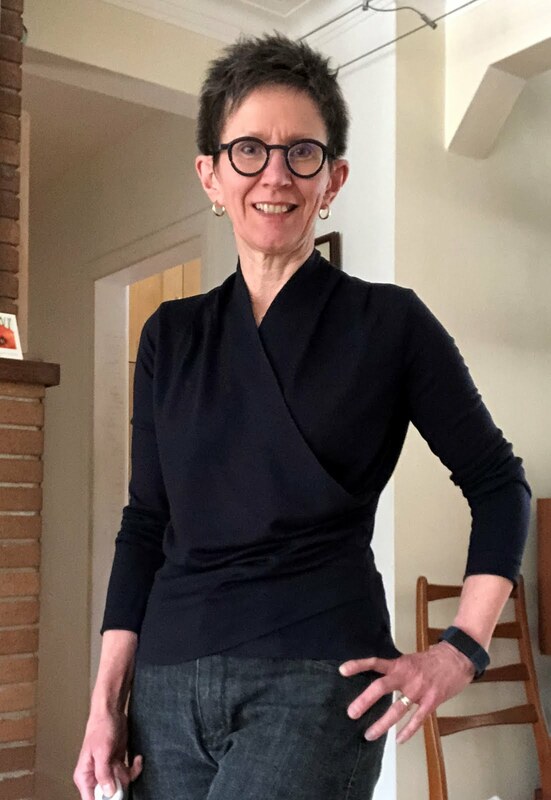 I decided to peg it in very slightly as I find this is more flattering in a pencil skirt. Then I downloaded the Threads Magazine article on making a couture guipure lace skirt (Susan Khalje, October-November, 2014). I want this thing to be wearable in my real life so the charmeuse under-layer was out - shiny and high contrast were not in the cards. 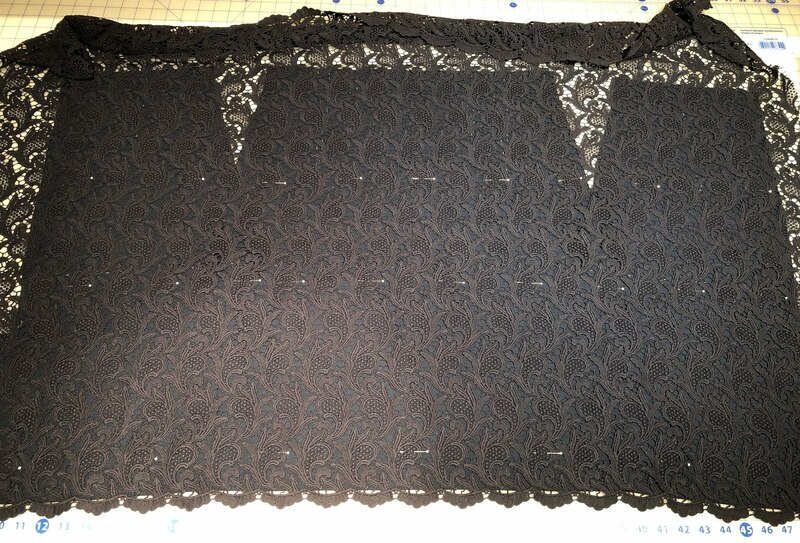 The stash contained navy wool crepe and navy silk organza that looked pretty good with my dark navy lace. 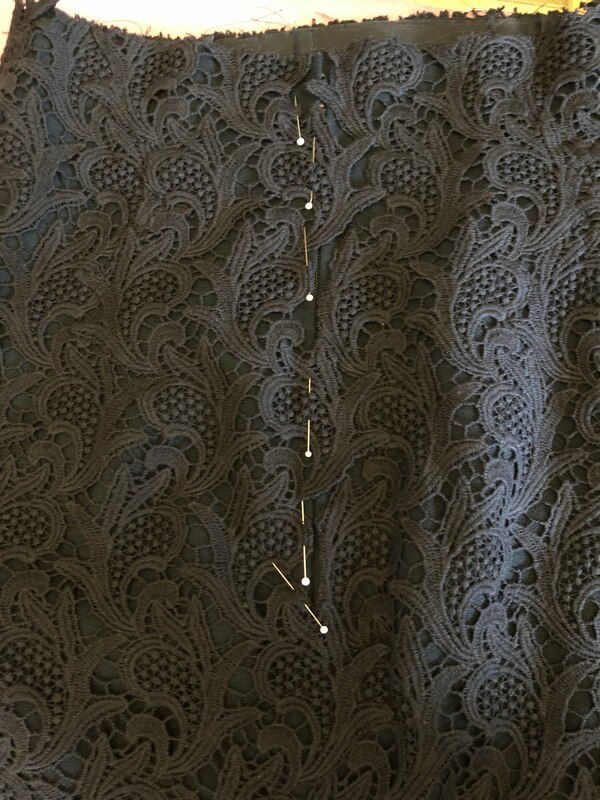 I joked that I was winging it in making this lace skirt, but in reality I dutifully followed Susan Khalje's instructions to thread trace the darts and hip line onto my underlined base. This is necessary because you don't sew the darts until quite a bit later after the fabric has been handled a lot. I spent much of this weekend bent over my skirt, hand tacking the lace to the skirt base (horizontal basting lines approximately 5cm apart from hem to waist). 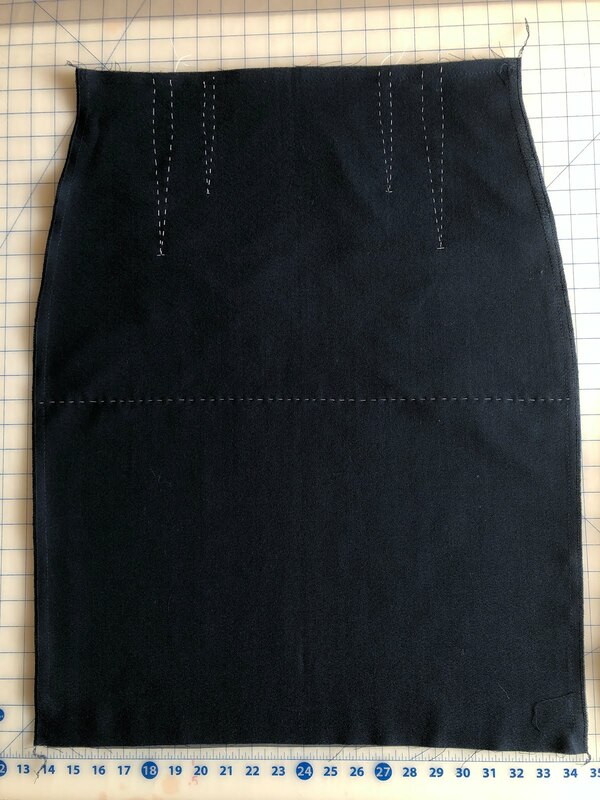 After this, I sewed the darts and side seams and then painstakingly cut the lace and repositioned it over the curves of the darts and side seams. 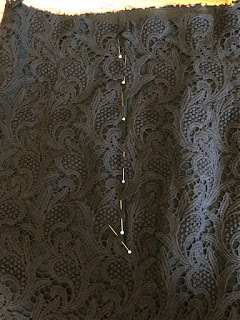 The cut motifs have to be invisibly hand sewed through both lace layers and the skirt base. I thought the repositioned motifs would be obvious because the pattern of my lace is so regular. Nope! Once tacked down, the shaping becomes invisible. At left is the CB zipper with cut lace. Some of the motifs overlap the zipper and I'll sew tiny snaps on those bits to hold them down. I'm almost finished with the lace. Then just lining and the waist finish remain. You’ve done a great job with the lace. Very impressive garment. It will look stunning with the navy top you’ve finished. And thank you for the source references for techniques! The lace is fabulous. Thanks for showing the skirt making process. I've been planning something similar with a piece of guipure lace I've had for awhile. Inspired to get to it now!